Dukkah, a loose savoury blend of toasted and roughly crushed nuts and seeds blended with spices, has Egyptian origins. Traditionally it’s served with bread which is first dipped into olive oil, sometimes for breakfast but generally as an appetiser or snack. Claudia Roden in her “New Book of Middle Eastern Food” says that the formula for dukkah varies greatly from family to family, so without fear of a cultural backlash I decided to have a crack at making my own blend. White sesame seeds, ground coriander and cumin seeds are common core ingredients and it was with these flavours I began. As I’ve said many times before, I’m a purist when it comes to spice. I buy in small quantities, use them up quickly and grind the seeds as needed, that way my spices are always fresh and aromatic. I chose to use nuts I had to hand, an unlikely but successful combination, the smoked almonds contributing a beautiful depth of flavour. Using pistachios, almonds or hazelnuts would have been more authentic. Half the batch I set aside to serve with drinks over the next couple of weeks, then I converted the to second portion to a savoury crumb to sprinkle on vegetable salads, on grilled meat and fish and on egg dishes for a crunchy protein element. Store in an airtight container or ziplock bag in the fridge for up to a month. I recentely learned about Dukkah, which seems like rock’n roll mix of nuts and spices. Really interested in this one – will try this out! Seems like this is the perfect mid-day snack. Your photo makes me want to dig in immediately. 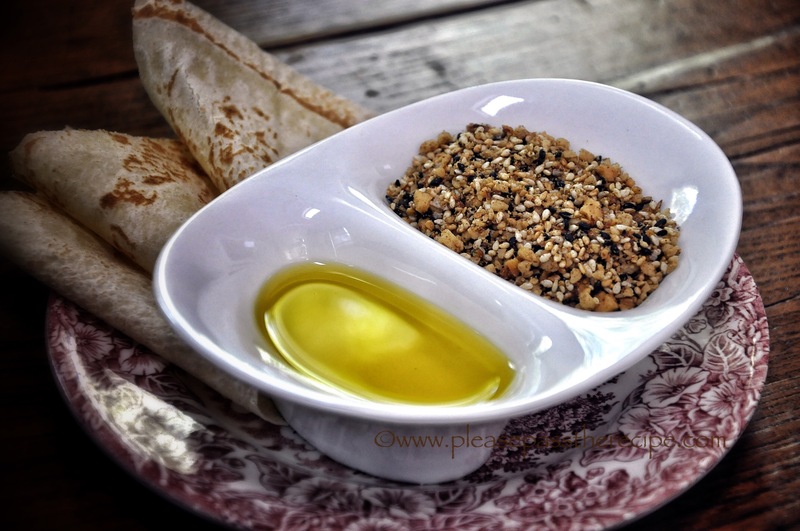 Yum – I absolutely adore dukkah! I’d never thought to make my own before. Thanks for sharing! Sandra, I absolutely adore dukkah but hate to admit that I’ve never made it myself. This mix sounds really wonderful with the macadamia nuts and smoked almonds… I’m going to have to try it! That dukkah crumble mix sounds like a great condiment to have on hand. Like the idea of it as a crunchy topping on grilled anything! I usually have pretty good discipline as far as food intake is concerned: you place an interesting dukkah in front of me and I cannot stop reaching for it ! Love both your dukkah and your crumble: macadamia nuts and smoked almonds do not oft appear in the mixes I have tried, so this is fun! Because of lack of time I first used Herbies as many of us Down Under I daresay have done, then found Maggie Beer’s with the addition of fennel and anise . . . . but would like to make my own again, so thank you!! The crumble promises to deliver lots of flavour!! Dukkah is a summertime favourite in our house, it’s never the same two batches in a row, but providing there are sesame seeds, nuts, spice, it’s dukkah. I’m addicted to aniseed flavours, so thanks for that inspiration for the future. Great minds Sandra. We both posted dukkah recipes at exactly 5pm today! Love the idea of using smoked almonds, and your dukkah crumble sounds amazing. Love the idea of a savoury crumble mix. Dukkah snap Sas! The crumble makes a fabulous textural contrast in salads, I’ve been sprinkling it like fairy dust. Love the idea of the smoked almonds in this mix Mrs R, a nice twist and using what’s on hand as well. The smokiness of the almonds worked really well with the spice Cheery, and so simple to make! I love the sound of that Dukkah crumble. What an interesting addition to a vegie dish. This entry was posted on November 13, 2014 by ladyredspecs in Dairy Free, Dips and Spreads, FODMAP diet, Food, Gluten Free, Light Savoury Dishes, Pantry Essentials, Side Dishes & Salads, Snacks, Spice blends and tagged dip, dukkah, nuts, seeds, spice.